Sewer Line Pipe Bursting Tacoma Lakewood Puyallup U.P. 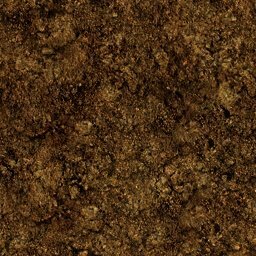 Although at Pielak Plumbing we talk about "trenchless sewer repairs" in reality we almost always have to dig. We need to dig down to gain access to the sewer line near your house or small office building. We also need to dig at the other end of your sewer line where it meets the main line. In pipe bursting we are going to connect those two points with new slick-surfaced, seemless plastic pipe. We have machines that can help us creat holes and short trenches, but quite often we're digging by hand. Shovels are not obsolete. Even our small, heavy equipment can't always maneurver under carports, between a garage and a building, and so we are ready for either opportunity. 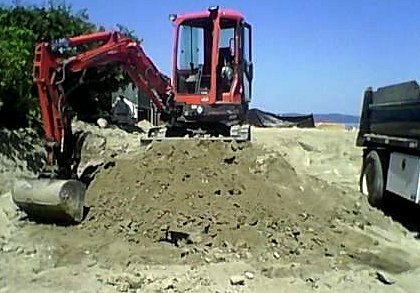 Covering up the hole, ditch, or trench is much easier with heavy equipment, but we always choose the tool that is best for our customers. Pielak Plumbing has solved sewer problems throughout the Tacoma Lakewood Puyallup University Place metro area. If you need our help, please call 253-227-0084. Pipe Bursting is exactly that. What we do is pull a "pipe bursting head" through the old pipe. This tough metal head is larger than the pipe it's going through. For each inch the head is pulled through the old pipe, it bursts or breaks apart the old pipe. 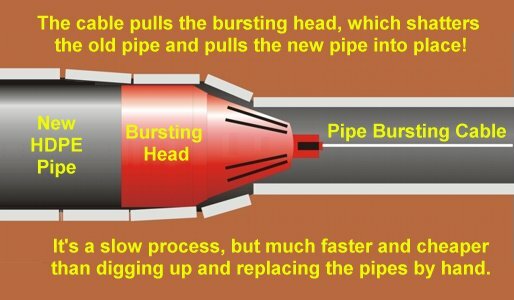 Following the pipe bursting head and connected to it is a seemless plastic pipe that has been heat-welded into one long section. The process is literally inch by inch as a piston driven compressor pulls the head and the new pipe along to its destination. If you have any questions about the process, please call 253-227-0084. Sewer Line Pipe Bursting Plumbing Tacoma Lakewood Puyallup University Place, trenchless sewer line repair tacoma, trenchless sewer line repair puyallup, trenchless sewer line repair gig harbor, Pipe Bursting Tacoma Lakewood Puyallup University Place, sewer line pipe repair and replacement Tacoma, sewer line pipe repair and replacement Puyallup, sewer line pipe repair and replacement Gig Harbor, Pipe Bursting Tacoma, Pipe Bursting Puyallup, Pipe Bursting Gig Harbor, Sewer Line Pipe Bursting Plumbing Tacoma Lakewood Puyallup University Place Washington WA.